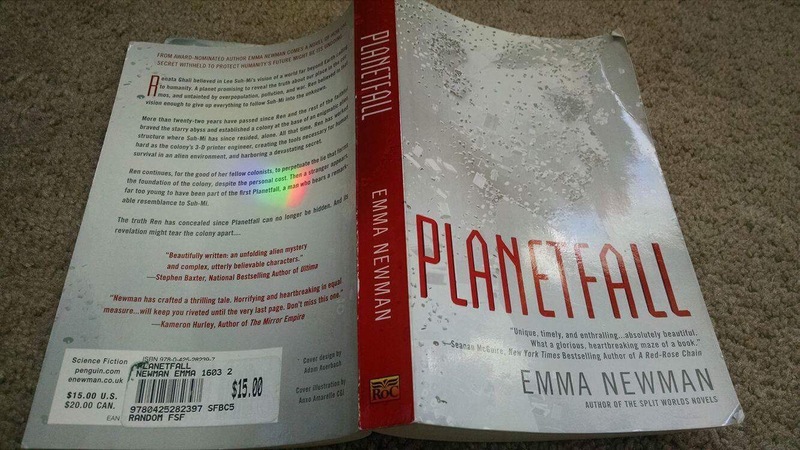 There’s no denying that British sci-fi and urban fantasy author Emma Newman is really cool. Not only does she write short stories and novels, design dresses, and narrate audiobooks (what reader doesn’t see that as a dream job?! ), she hosts and co-writes a visionary Hugo-nominated podcast, Tea & Jeopardy. 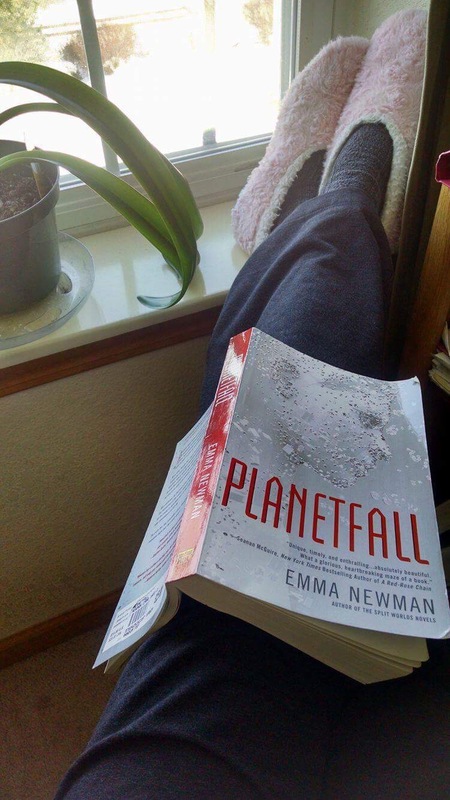 As if that weren’t enough, Newman is open about her experiences with anxiety, postpartum depression, and more–and incorporates these into her writing: yes, we sci-fi readers have an ally and inspiration in Newman as an author, world-builder, and character-creator. 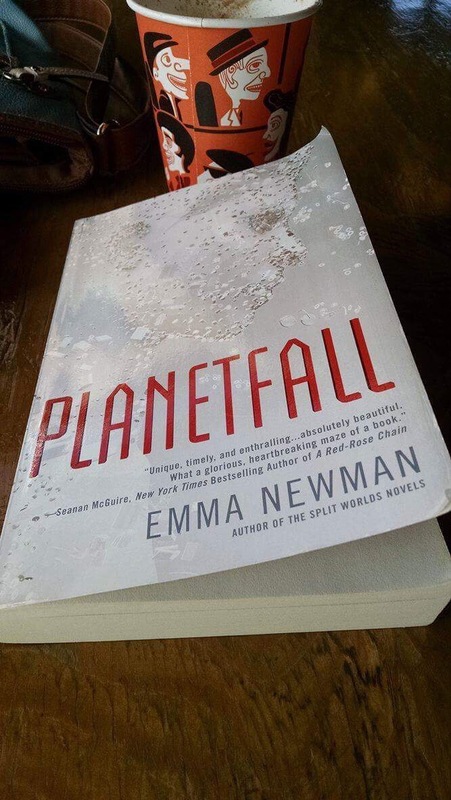 Planetfall is Newman’s first sci-fi novel, and while it’s a little over a year old now, I was amazed and grateful at how timely, relevant, and pressing it is. Set in a not-too-distant world where gov-corps control highly-stratified nations suffering from enormous wealth divides, oppression, and environmental ruin, main character Ren has an opportunity: she can leave Earth with a prestigious group of fellow scientists and doctors in order to follow the brilliant Suh, a university friend who has seemingly received a vision from God calling humanity “home” to “God’s City” on a faraway planet. From the get-go, Newman makes it clear that life on Earth has become stifling, bleak, and all but hopeless. Grieving the loss of her young daughter, and fed up with her relationship with her narcissistic mother, there is little keeping Ren on Earth but the pleading voice of her idealistic father, who believes Ren’s breakthrough visengineering system of 3-D printers can save countless lives on Earth. It’s just one of several complex ethical questions facing Ren throughout the novel, and the reader can’t help but wonder how he or she would react in the same situation. Set 20 years after Ren, Suh, and the other colonists “make planetfall” on their new planet, when the book opens the new colony appears to be humming along. Ren’s 3-D printers have made human labor almost obsolete. Homes, clothing, food, organs–all can be printed thanks to her. They live sustainably, recycling their raw materials in a mashing system, and building homes that make their own energy. But the peaceable facade and the premise of the colony has come at a price, which Ren has helped to cover up all these years. Where is Suh, the original leader, for example? One day, Suh’s grandson, Sung-Soo, emerges out of the harsh grasslands beyond the colony’s gates and upsets the balance. Ren, suffering from tremendous, untreated anxiety and OCD, begins to fear she can’t keep lying to the colony any longer about what really happened during “planetfall” 20 years ago. Planetfall is a slow burn, but the world-building and character development are fascinating and kept me engaged for all 320 pages. For those who, like me, were intrigued by Newman’s extensively-created futuristic space colony, her 2nd novel came out this past November. Titled After Atlas, It’s deemed a “stand alone novel set in the same universe” as Planetfall. As After Atlas has received rave reviews from readers, I’m guessing Newman really hits her stride in her 2nd novel, and I am definitely looking forward to checking it out. This entry was posted in A Word From My Friends, Book Reviews and tagged AWordFromMyFriends, EmmaNewman, GuestReviews, Planetfall on March 20, 2017 by redstarreviews.